DURHAM, N.H. - Researchers at the University of New Hampshire have captured a difficult-to-view singular event involving "magnetic reconnection"--the process by which sparse particles and energy around Earth collide producing a quick but mighty explosion--in the Earth's magnetotail, the magnetic environment that trails behind the planet. Magnetic reconnection has remained a bit of a mystery to scientists. They know it exists and have documented the effects that the energy explosions can have--sparking auroras and possibly wreaking havoc on power grids in the case of extremely large events--but they haven't completely understood the details. In a study published in the journal Science, the scientists outline the first views of the critical details of how this energy conversion process works in the Earth's magnetotail. 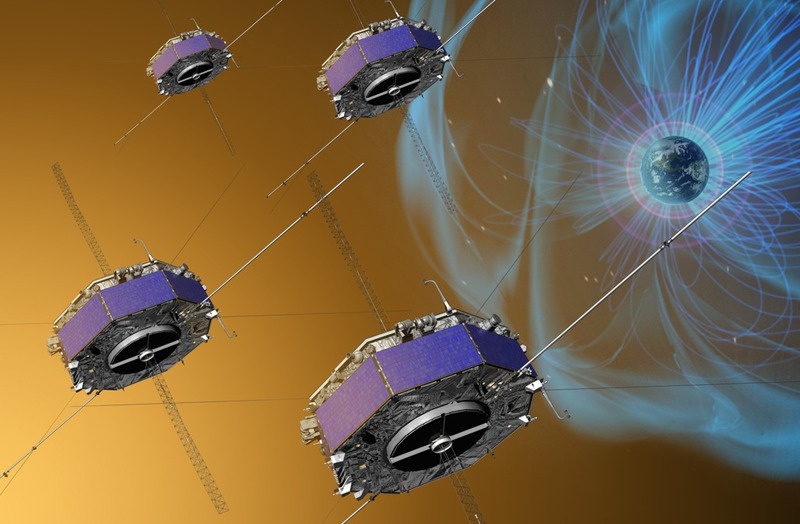 Magnetic reconnection also happens on the sun and across the universe--in all cases forcefully shooting out particles and driving much of the change we see in dynamic space environments--so learning about it around Earth also helps us understand reconnection in other places in the universe which cannot be reached by spacecraft. The more we understand about different types of magnetic reconnection, the more we can piece together what such explosions might look like elsewhere. Artist depiction of the MMS spacecraft that provided the first view of magnetic reconnection. In its second phase, NASA's Magnetospheric Multiscale Mission (MMS) is watching magnetic reconnection in action behind the Earth, as shown here by the tangled blue and red magnetic field lines. On Earths dayside, magnetic reconnection is asymmetric -- meaning it flings particles, like ions and electrons, unequally in different directions. In this simulation, particles are seen primarily moving upwards away from the site of reconnection along the black magnetic field lines. Behind Earth, away from the Moon, magnetic reconnection occurs symmetrically. This simulation shows particles traveling away from the site of reconnection equally in both directions, confined by the red magnetic field lines.